In 1936 Arthur Judson, the General Manager of the New York Philharmonic-Symphony Orchestra sprang a major surprise by engaging a young British conductor, John Barbirolli, to conduct the orchestra for ten weeks to fill part of the void left by the departure of Arturo Toscanini. Barbirolli made a very favourable first impression and was quickly signed up as permanent conductor of the orchestra, a post he was to occupy until 1943. His time in New York was not entirely happy. He suffered at the hands of some influential critics, especially Olin Downes and Virgil Thomson. However, the notion that he was a failure in New York was long since debunked, notably by Michael Kennedy’s biography of the conductor and subsequently by the release on CD of a good number of commercial recordings and broadcast performances, which proved that JB got extremely good results from the orchestra. The players liked him and so did the audiences. Barbirolli wasn’t driven out of New York by the critics. The invitation in early 1943 to take over the Hallé was opportune partly because Barbirolli, as a British citizen, was about to encounter work permit issues, which would have made a longer stay in the USA difficult and partly because he felt uncomfortable being away from wartime Britain. It was to be sixteen years before he returned to the NYPO. By that time he had established an even stronger international reputation thanks to his work with the Hallé and through a growing discography. He had also been knighted. So he came back to New York an even more established figure than when he left. For his return he brought with him four programmes, which, not surprisingly, played to his strengths; JB wanted to make an impression on New York once more. With two exceptions - Weber’s Der Freischütz overture and the Brahms Second Piano Concerto (with Gina Bachauer) - all the music he conducted during those concerts is included in these CDs. Let it be said straightaway that this is an important set. Most of the repertoire is familiar Barbirolli fare - though he never recorded The Planets commercially - but it’s invaluable to hear him playing these pieces live and with one of the finest orchestras in the USA. On the evidence of these discs it’s no surprise that his return to New York was a great success for the standard of music-making is very high and a testament not only to Barbirolli’s stature as a conductor but also to his ability to establish a rapport as a guest conductor. It’s interesting to note in that context that thirty-three members of the orchestra remained from his time in charge - I suspect, however, that the long-serving concertmaster, John Corigliano, who occupied the orchestra’s first chair from 1943 to 1966, and who, I assume, plays on all these recordings, just missed the Barbirolli era. From Barbirolli’s first programme comes the Elgar Introduction and Allegro. If the conductor wanted to set out his credentials he could hardly have done so more impressively, for this is a magnificent, surging account of the piece. It was one of the earliest works that Barbirolli conducted in public - back in 1925 - and, apparently, after hearing one of his early performances Elgar remarked that he hadn’t realised he’d written such a big piece. Well, it’s big here - though not in any overblown sense. It’s a joy to hear it played by a world-class string section and the NYPO performance must have thrilled Barbirolli. It’s confident and assertive but there’s tenderness too when required. It helps that the sound quality is some of the best in the set and, indeed, I’m tempted to say that overall this is the best performance in the box. One contemporary critic commented during JB’s series of concerts with the orchestra that he had produced “a golden luster absent from the Philharmonic string section for fully fifteen years.” Hearing this performance one is not surprised at that comment. The same programme included the Vaughan Williams Eighth Symphony. This was a very new piece at the time - Barbirolli had given the première of the work, which is dedicated to him, in 1956 - and with this series of performances he probably unveiled it to New York audiences. The orchestra plays it very well. Comments by the local critic Howard Taubman are quoted in the booklet. He refers to “a vivacious, expressive performance” and to Sir John’s “affectionate understanding”. Those views seem fully justified to me. In the first movement the noble, expansive climax particularly catches the ear, while the precision of the wind and brass sections is excellent in II - there’s a brilliant trumpet solo. Having excelled in the Elgar work, the NYPO strings exhibit a different type of virtuosity in III. Even allowing for sound that is over fifty years old the richness of their corporate tone is obvious and the rhapsodic violin solo, presumably played by Corigliano, is wonderful. RVW was on top form in his writing for strings in this movement and the New Yorkers seem to enjoy every moment. The whole orchestra relishes the ebullient finale, with the percussion section having a field day. I was delighted to hear the shouts of appreciation from the audience at the end: a few months after the composer’s death ‘Glorious John’, one of RVW’s great champions, clearly scored a conspicuous success in Manhattan with his old friend’s music. The second programme included Barbirolli’s own orchestral arrangement of some short Elizabethan pieces. They’re played well enough here but, frankly, I can’t work up a great deal of enthusiasm for them. The Haydn symphony is another matter. We read in the booklet that Howard Taubman opined that the performance “was straightforward, neatly phrased and justly paced, but it was not exactly a fresh adventure.” I agree with the comment about the phrasing and pacing but, overall, Taubman was a little less than fair. The phrasing in I is spruce and the playing is alert. For my taste the second movement is a little too spacious - as was often the way in those days - but III, though sturdy, is well sprung and the trio is relaxed and genial. The bustling finale is full of high spirits and this performance sounds like good fun and made me smile. Incidentally, an earlier commercial recording of this symphony, by Barbirolli and the Hallé, dating from 1953, has been issued by Dutton (CDSJB 1003). WHRA advertise these recordings as previously unissued. However, they’re slightly in error because the performance of Mahler’s First Symphony was issued a few years ago by the New York Philharmonic in their deluxe boxed set of all the symphonies, “The Mahler Broadcasts, 1948-1982”, which was rightly lauded by Tony Duggan in his survey of Mahler symphonies on CD. Tony described the Barbirolli account of the First as “ripe” and I can only agree. Comparing the two transfers, which I’m sure are from different sources, the NYPO transfer is smoother, whereas the WHRA has more surface hiss, though one quickly adjusts. However, I was less conscious on the WHRA set of the bronchial New York audience, which is particularly distracting at the start of the first movement on the NYPO issue. In any event, only specialist Mahler collectors will want to invest in the NYPO box, which is very expensive, and so it’s a cause for celebration that this fine performance is now available in a more affordable format. It’s a fine, characterful reading. Barbirolli’s interpretation was well settled - he’d recorded the piece with the Hallé back in June 1957 (Dutton CDSJB 1015). The introduction to I is as mysterious as the coughing audience will allow, after which the main allegro is purposefully done. Barbirolli maintains the tension very well and, I find, draws the listener into the performance. At the start of II he sets a tempo that’s deliberate and sturdy - just a bit too sturdy for my taste. That said, he encourages the horns to play with pungency and there’s good attack from the strings so the music has a nice rustic feel. When we get to the trio we find JB drawing warm phrasing from the strings, who employ a pleasing amount of portamento. The end of the movement, though steady once more, has conviction and excitement - you feel that the conductor, as well as the horn section, is letting rip. There’s a suitably wheezy double-bass solo at the start of III and the movement is shaped with great character by Barbirolli - indeed with more character than some twenty-first century listeners may expect. The ‘Lindenbaum’ episode is a particular success; JB obtains some warmly phrased and affectionate playing from the strings and, indeed, from all the players involved in this passage. There’s real fire and urgency at the start of IV; the music is, indeed, ‘Stürmisch’ as Mahler marked it. Later on, the great, broad string melody is caressed, but not sentimentalised, by Barbirolli for whom the New York strings really sing. After that he builds the tension masterfully until the opening music returns in full spate. The entire finale has huge energy though the lyrical passages are lovingly played. One feels that a true Mahlerian is at the helm. The performance of this symphony is one of great stature and character. It’s interesting that in the aforementioned NYPO Mahler boxed set, though the work of many great Mahler conductors was included, Barbirolli was the only one represented by two complete symphonies; a signal distinction. Hearing him conduct the NYPO like this in Mahler one understands why. Rightly, he and the players were accorded an ovation. The third programme featured five of Holst’s seven Planets; ‘Neptune’ and ‘Saturn’ were omitted - the latter to my particular disappointment, for it’s my own favourite. I believe that Barbirolli was wont to play extracts from the complete suite in concert and also to play the movements out of their customary order, as here. This performance will be of especial interest to Barbirolli aficionados since he left no commercial recording of the work. Barbirolli invests ‘Mars’ with great power, especially when the 5/4 rhythm is re-established after the 5/2 episode. It’s a gripping reading. ‘Venus’ I find a little slow at the start - the music seems a little bit earthbound. Later on, when the violin solo is reached - and its played beautifully here - the tempo moves on more satisfyingly and, indeed, there’s a good deal of impressive solo work to admire in this movement. However, this is one of the few occasions in the set when the closeness of the recorded sound does rather vitiate the magic of the music. The basic tempo for ‘Uranus’ is again a little on the steady side, but not to the point where the speed works against enjoyment, and the big swinging horn theme a few minutes in is super. The big, galumphing main tune is splendid, building to a mighty climax, after which the quiet ending is atmospherically managed. ‘Jupiter’ is colourful and lively. When the famous Big Tune is reached JB ensures it’s played with a noble, sustained line. It’s not overblown but it’s very well presented. The Brahms Violin Concerto features an American soloist, the Philadelphia-born Berl Senofsky (1928-2002), here making his debut with the NYPO. He proves to be a very accomplished soloist and I wouldn’t dissent from Taubman’s verdict that his playing “had authority and penetration”. The long introduction in the first movement is spaciously unfolded by Barbirolli but though the pace is broad both he and Senofsky are clearly intent on a bold, assertive reading, yet one in which the passages of repose are played with a winning lyricism. I’m not sure whose cadenza Senofsky plays but it’s not the familiar one by Joachim. Perhaps the passage after the cadenza is taken at a pace that’s a little too leisurely but overall I enjoyed this performance very much. The glorious oboe solo at the start of II is beautifully done and Senofsky himself spins an excellent line throughout the movement, offering some distinguished playing. The finale is dispatched with appropriate gypsy fire. All the programmes chosen by Sir John contained music to which he was close and which, customarily, he did well but for his final programme he offered a true Barbirolli signature work, The Dream of Gerontius. This was a novelty for the New York audience, for the piece hadn’t been given by the Philharmonic since 1932 - and it would not be played again by them until 2001. As his Gerontius Barbirolli had one of the leading exponents of the title role in the shape of Richard Lewis, making his US debut. 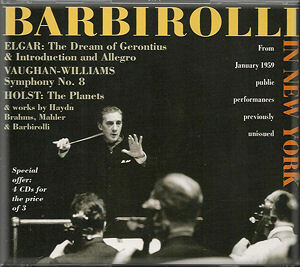 He would go on to take part in Barbirolli’s celebrated 1964 recording of the work. Here we find him in fine voice, once we’re past what sounds to me like a surprisingly tentative first phrase. He’s intimate with the role, which he’d already recorded for Sir Malcolm Sargent, and so he brings out both the ardent passages and the many more reflective sections. His voice is well reported by the recording and arguably he’s in fresher, freer voice than was the case in the 1964 recording, despite the fact that this would have been his third traversal of the demanding role in four days. His admirers will want to hear this because he was five years older when he came to make the EMI recording with Barbirolli and, I believe, he was slightly inconvenienced by a cold during those Manchester sessions. Of particular interest is the appearance as the Angel of Maureen Forrester (1930-2010), only a couple of years after she’d made such a successful NYPO debut in Mahler’s Second Symphony with Bruno Walter, a performance memorably preserved on the Music & Arts label (review). To the best of my knowledge this fine artist never recorded the role of the Angel commercially so it’s marvellous to hear her in it, all the more so because she sings the part so well and with such intelligence. Her tone is full and warm throughout and she displays excellent feeling for the music and for its spirit. I’m afraid I can’t be anything like as enthusiastic about her fellow Canadian, the baritone Morley Meredith (1922-2000). I took little pleasure from his singing. It sounds as if he frequently attacks words such as “go” from below and his often-mannered delivery of the words makes him sound stilted. The Westminster Choir sings very well. The orchestra sounds somewhat distant at times - certainly the soloists are much more forwardly placed. But the orchestral contribution is evidently a distinguished one, nonetheless, not least in a well-played account of the Prelude to Part I. Barbirolli is masterly, conducting with a mix of deep love for the music and dramatic flair. This was surely a score that he was born to conduct and in this Gerontius he really shows the New Yorkers - if they needed showing - what a wonderful conductor he was. A calling card indeed. The performances of Gerontius, of which the last one is preserved in this collection, set the seal on Barbirolli’s triumphant return to the NYPO podium. He was a very fine conductor when New York first heard him. By the time he returned he had become a great one. This is a set of huge value and it will surely be eagerly sought after by all admirers of ‘Glorious John’. As ever with WHRA, production values are high. The booklet includes an extensive and very interesting essay by Lani Spahr, who has also done the transfers. One realises that these recordings are over fifty years old and they weren’t made under studio conditions. Nonetheless, the performances are very well reported and even on the few occasions when there’s some distortion the sound never detracts from the pleasure of the music-making. Above all, the authority and humanity of Barbirolli’s performances reach out to us across the decades. It’s been a delight to hear these recordings and I recommend the set with great enthusiasm to all admirers of this great British conductor. One final thought. I mentioned at the top of the review that a couple of pieces that Sir John conducted in these NYPO concerts have not found their way into this set. Furthermore, during this American tour he also conducted two more great American orchestras, those of Philadelphia and Boston. His repertoire for the tour included the Dvořák Eighth Symphony and also a couple of works that he never recorded commercially - Arnold’s Tam O’Shanter Overture and the Walton Violin Concerto. If recordings of these performances exist it would be wonderful if WHRA could follow up this excellent set with a further box, ‘Barbirolli in America’. For now, however, this souvenir of a great conductor reunited with a great orchestra will delight collectors.